What was the first thing we did upon arriving in Austin, Texas? We got some stupid delicious donuts made inside an Airstream. Duh. Donut menu. We should have ordered all of them. Gourdough's Donuts wasn't an official suggestion on the map, but someone did tell us to go there and thank goodness we did. 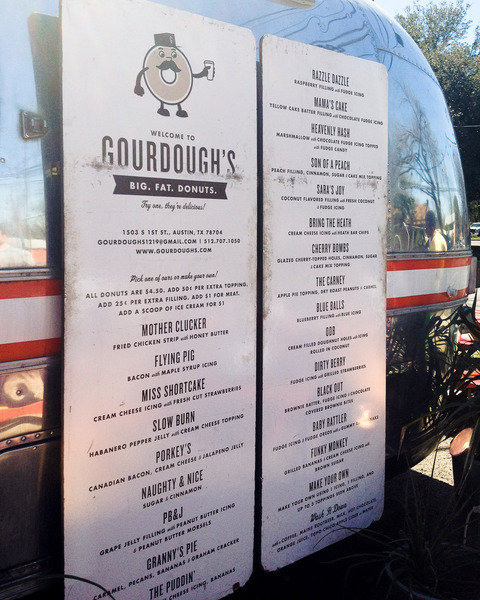 Gourdough's is an Airstream food truck parked in a lot on South 1st Street. They specialize in huge donuts with crazy and imaginative toppings of the sweet and savory variety complete with sassy names, like Son of a Peach (peach filling, cinnamon, sugar and cake mix topping) and Mother Clucker (a donut topped with fried chicken and honey butter). Mother Clucker and Flying Pig. Nom nom. 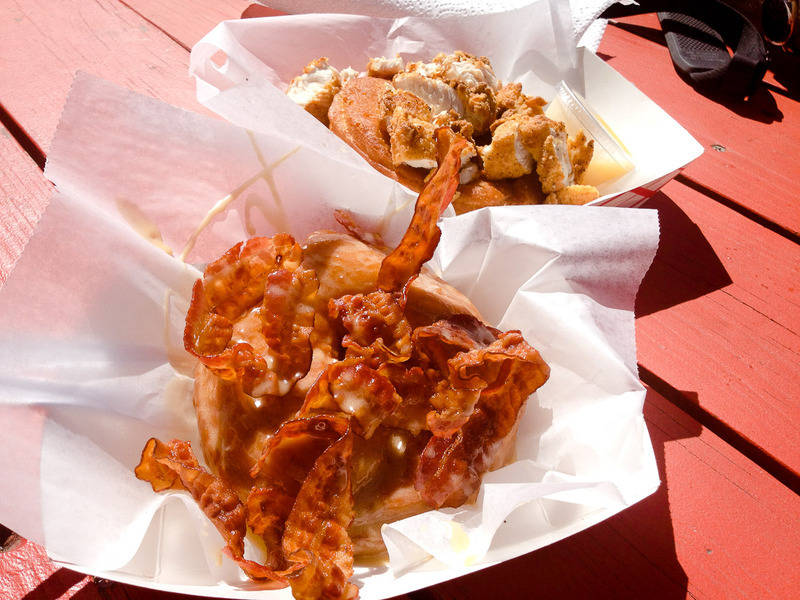 We opted for the savory (this was our lunch after all…we're so healthy, I know) and ordered the Mother Clucker and the Flying Pig (a donut topped with bacon and maple icing). We talked Airstreams a bit with the friendly guy working the counter, but once we received our donut feast, no more words were had. The donuts were perfectly cooked, not greasy and complemented the savory meaty toppings. Such a fantastic contrast and combo of crispy, doughy, saucy, sweet and savory. 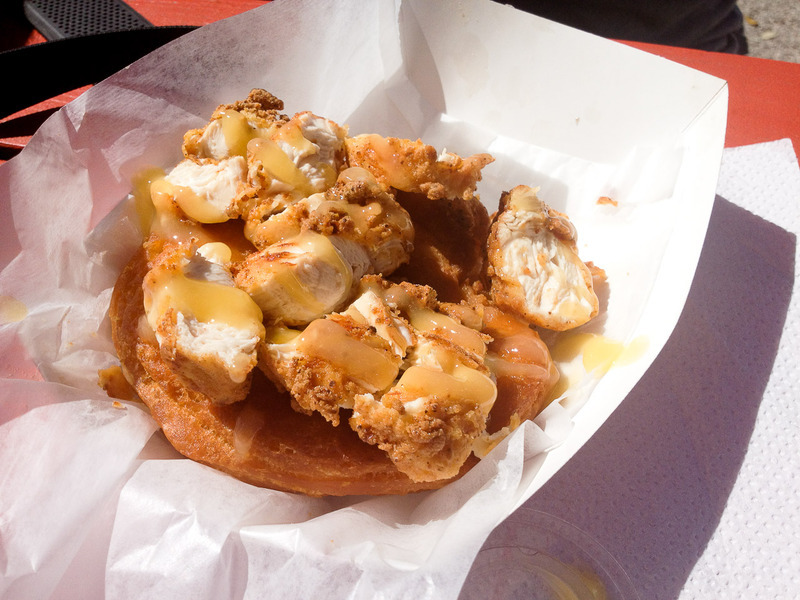 The sweet and savory combo of fried chicken and honey butter on top of a donut. Ridiculous.